I don’t know what I expected when I looked into white and brown bread, but I didn’t expect the difference to be caramel. These two breads are almost identical. The ingredients, the processing, the baking. All the same, except for caramel. You see, brown bread is white bread in disguise. More often than not, the brown in brown bread is added on purpose. It’s not the natural outcome of a different cooking method, it’s not a more natural and organic ingredient. Most often, it’s caramel. Truthfully, if you’re not used to being deceived by your supermarket it’s time to start asking questions. A lot of the time, choice is an illusion. So if you want a healthier bread you should go with a multigrain loaf, right? Sadly, the deception continues. Multigrain is again most often a dressed-up white loaf. Sprinkle a few seeds here, a few grains there … and no-one will notice that it’s the same thing. 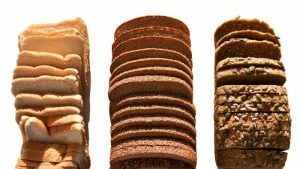 Don’t get me wrong, legitimate multigrain breads do exist though you’ll have to sift through the imposters to find them. And what is a REAL multigrain? Why, it’s a bread made from multiple grains, of course! Which only really matters if those grains are whole grains. Whole grain bread actually does have a legal categorisation. It has to contain at least 51% unrefined grains. This is good news, as if you’re actually wanting to get some nutrients from your bread then wholegrain is what you need. So what’s so different about whole grain bread? It’s all in the milling. Whole grains are unrefined, meaning that the bran, germ and endosperm of the grain are intact. But be sure that you check the ingredients, and not just the label. While 51% whole grain is better than white bread, 100% varieties are out there. Let’s take a quick throw-back to last week where we discussed white and brown rice. Remember? Of course you do. You’re a loyal reader. Anyway, brown rice is like whole grains. The bran and germ are intact. The lesson here being that nutrient content isn’t the same as nutrient intake, thanks to our long-term nemesis phytic acid. That sucker will get all up in your nutrients, and inhibit your absorption of them. But at least you’re getting what you’re paying for. 100% whole-grain bread is 100% whole-grain bread, unlike multigrain or brown bread. Or better yet, make your own! It’s not too difficult if you have the time, and it gives you the freedom to be selective. You owe it to yourself to know what you eat.